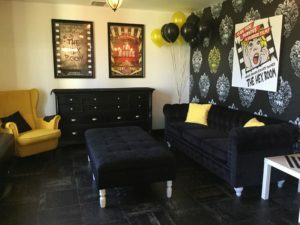 Looking for something fun and unique for your Birthday? This is it! We host parties for all ages! The Fun House KIDS is great for kids ages 8-13, this game is full of silly surprises and wacky fun! 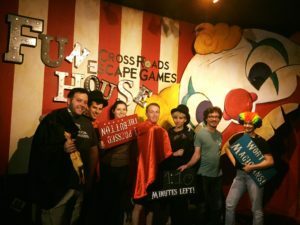 If you have a group of adults or teenagers who want a thrilling and creepy night, The Hex Room is a great choice. Or maybe you are looking for something a little more strategic? 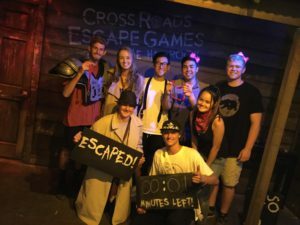 The Psych Ward is great for competitive adults and teens who are up for something a little different. No matter your choice, Cross Roads will have your guests talking for weeks about how cool your party was! If you are looking for a place to go after your game, our exclusive lounge space is a perfect for your party! We charge $50 for a 1-hour rental which includes the room, balloons, plates, utensils, napkins, cups, and clean up. Please be aware that the lounge can comfortably hold 12 people max. If you would like food at your party, it is the guests responsibility to order and arrange any catering services. We recommend: Pepz Pizza, Mendocino Farms, Panera Bread, or Olive Garden.